If you’re fortunate enough to afford a book publicist, the chances of your book succeeding go way up. Publicists are experts at language that persuades reviewers, bloggers, and influencers to write about your book. But I’m convinced that you, and not they, should write the first draft of the marketing copy. Marketing activity for a book includes the marketing copy on or in the book itself, marketing outreach to bookstores, publicity outreach to journalists, bloggers, and other reviewers, and social media sharing. The publisher will conduct some of this activity (flap copy and outreach to bookstores). Publishers, authors, and outside publicists all work on parts of the the publicity outreach. Here are some examples of marketing-related copy that your book needs. Flap copy. 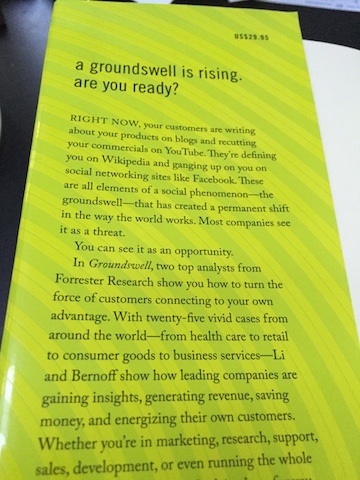 On a hardback, this is the 300 words or so of text on the front and back bookflap, copy intended to get people considering the book to understand its benefits and buy it. If your book is a paperback, this copy is shorter and often appears on the back cover. Copy for the book’s listing on Amazon and other online booksellers. Ideally, this is the same as the flap copy (why maintain two sets of copy that do basically the same task?). If you’re sending out advanced reader copies (also known as “uncorrected proofs” or “galleys”), a letter that accompanies those copies explaining why the book is important and who the author or authors are. An email template for journalist and influencer outreach. Whoever sends these emails should personalize them for the recipient, but they will all draw from a set of basic points. Some sort of an information sheet for the publisher’s sales team — the people who will be calling on online and offline bookstores to tell them about the book. These are just the copy tasks. The marketers and publicists do a lot of relationship work with bookstore buyers and journalists. They know who to talk to, what their tendencies are, and what they tend to write about. This is all valuable work and expertise worth paying for. They’re also experts in writing the copy that these people will read. So why should you draft that copy first instead of just letting them write it? You know the book. They know what works. Consider the plight of the publisher’s marketing team or the publicists at a publicity agency. They have a near-final draft of your book. They read the first chapter or two. The review the table of contents and skim the rest. They may even read the whole book. If they write the copy — the flap copy, the galley letter, the reviewer outreach — they’re going to guess what’s most important about the book. And they’re going to get it wrong; they just just don’t understand the book the way you do. You just spent at least six months writing it, and it’s your baby — there’s no way they can understand it the way you do. Compare that to your situation. You may or may not know much about writing marketing copy, but you know more than anyone else about the book. If someone asks you what the main ideas are, you can rattle those off without even thinking about it. You know the best stories in the book, the most shocking ideas, and the most powerful conclusions. Not only that, you are a writer. Writing great prose is supposed to be what you’re good at. I’ve now had this experience several times: the publisher writes the flap copy. My coauthors and I look at it and wrinkle our notices — it’s a good try, but it’s just a bit off. I write 300 words of flap copy and say “use this instead.” The publisher, my coauthors, and I all agree the new copy is better, and we use it instead. Are you the best person to write about how great your work is? Probably not. If you’re a marketing copywriter, you may do a great job. But writing copy for journalists or bookstore buyers is a specialized task that is most likely outside your area of expertise. And you’re compromised since you’re writing about your own work and you’re in love with it. You’re not objective. Even so, the best way to communicate with the people who are experts at writing this stuff is to write it yourself. They’ll take the words and ideas in what you draft and rewrite them to fit the specific needs that those pieces of copy need to fulfill. 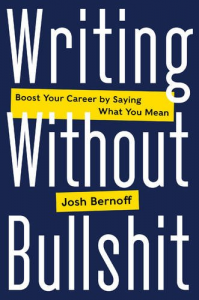 I think publicists are shy about asking for this — they have pride in the work they do, and they don’t want to bother authors with writing copy that they are supposed to write. But we’re writers. Writing is easy for us, especially after we wrote a whole book about this stuff. What about the time required to write these marketing drafts? In my experience, the time to write a draft like this is less than the time required to get on the phone and talk to marketing people, look at their best attempts to render those ideas, correct what they wrote, and get it to do justice to the book. These marketing and publicity people will have insights about which of your cherished ideas are worth trumpeting, and which are mundane and won’t make an impact. They may find gems in your writing that you’d forgotten and want to highlight them. These insights are all valuable. But give them a fighting chance and draft some copy for them to start with. The results will be better and you’ll spend less time shaking your head in frustration.